Talk about an episode with a serious downward emotional trajectory. Like, I knew it wasn’t going to be all happiness and fuzzy bunnies throughout — The Flash, while a great deal lighter than many comic book adaptation shows of similar ilk, still has to lay on the drama — but I was not prepared for the valley of despair this episode launched us into. Especially when contrasted with the way the episode started out. I thought that Barry’s proposal from the last episode would get interrupted before Iris could say anything, or she would say no for some reason, but nope! She said yes, and she and Barry have called the whole team to S.T.A.R. Labs in order to make the happy announcement. It’s joyful. It’s adorable. Even Joe’s disappointment at not getting a heads up from Barry on the whole proposal thing doesn’t dampen the high spirits. Furthermore: Wally’s speedster training is shaping up nicely and his latest test puts him within the speed requirements of saving Iris from Savitar, a development that also works to lift spirits on Team Flash. Wait, wait, Caitlin’s got a secret, too! She saved a piece of the Philosopher’s Stone from getting thrown through time or whatever, on the off chance it might cure her of her Killer Frost powers. I don’t know when she had a chance to swipe that Stone fragment, but fine — I accept that she did it, if only because the show needed a key to “unlock” Savitar from his prison. And who’s the one to do the actual unlocking? Poor, poor Wally. Wally’s increased pressure, plus feeling like an unwitting traitor to the team, leads him to trying even harder at saving Iris. Iris and Wally might not have grown up together, but you don’t doubt for a second how much Wally loves his sister. I personally don’t think the two characters have gotten enough screen time together, so I can’t credit that to the writers, but the actors do such a great job as playing their sibling roles that it doesn’t even matter. I buy that Wally would try just about anything to save his sister from dying, including actually witnessing the death itself just to scope out the situation. Keiynan Lonsdale does a great job with Wally’s steady breakdown and increasing desperation throughout the episode, culminating in a complete collapse when Savitar shows up as Wally’s dead mother. The encounter has layered intensity, with the viewers’ knowledge that “Francine” is actually Savitar, Wally sobbing and hugging thin air, and Jesse witnessing her boyfriend having a terrifying lapse in sanity. Although Jesse runs to get help and Wally does figure out that the person he’s talking to isn’t actually his mother, it’s too late. Savitar’s plans have gone into motion, and Wally plays right into them when he takes the Philosopher’s Stone fragment and throws it into the Speed Force. ... I think? Okay, I’m going to be completely honest: I have no idea what the climax of this episode was. Barry catches up with Wally just as Savitar is reaching through to pull Wally in and Barry does absolutely nothing to help him and I don’t understand why. Savitar is able to escape his dimensional prison not because of the Philosopher’s Stone, but because Wally took his place and I don’t understand why. Everything went according to Savitar’s plans and I don’t understand how. I do understand that Barry got super stabbed, though. And that everyone ends up sad. The worst thing is that I know they’re coming from a good place — I know that Barry is not doing these things because he’s inherently selfish, or because he wants power, or because he doesn’t care about what happens to other people. Generally, he wants to save people. He wants to keep the people he loves from getting hurt. He wants to make sure that villains don’t go on to hurt people, even people Barry’s never met before, and he does a lot of ill-advised things as a result. However, in “The Wrath of Savitar” we learn how unsettlingly calculated Barry has been in his quest to save Iris. 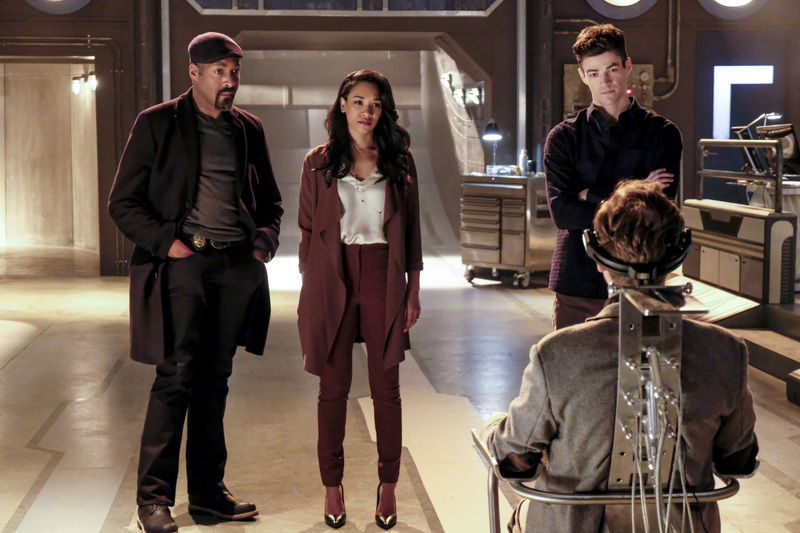 Last episode’s proposal was not a spontaneous moment of love brought on by The Flash’s delayed Valentine’s Day, but a way for Barry to further change the future in which Iris dies. When Wally gets Cisco to vibe him into the same vision of the future, he notices the lack of ring on Iris’s finger, adds the clues up, and confronts Barry. During the confrontation, there’s a small moment of superb acting from Grant Gustin where Barry looks like he genuinely hates that Wally figured him out. In that moment, it’s very clear that Barry cares more about getting caught than he does about doing wrong, since his actions revolve entirely around making sure that Iris survives her encounter with Savitar. Barry is afraid for Iris’s life and he wants to keep her safe. Barry’s fear is also what leads him to kick Wally off the team, which — it could be argued — is what eventually leads to Wally falling into Savitar’s trap. From a certain perspective, anything guided by a desire to keep loved ones safe is a perfectly valid and honorable motivation for a hero to have. And this is the problem with heroes like Barry: he knows he’s good. The characters around him know he’s good. We, the audience, know he’s good. There isn’t even much fuzzy gray morality where Barry is concerned, because he’s our floppy-eared golden retriever puppy and how can floppy-eared golden retriever puppies be anything other than light and loveliness? But there reaches a point where someone like Barry, who has always had “good” on his side, becomes incapable of recognizing when he’s doing wrong or even when he might be too overwhelmed by certain emotions (fear, grief) to make wise decisions. It becomes a situation where Barry’s actions, in his mind, are automatically slotted into the categories of “good” and “right” simply because he is the one doing them, and that’s a very dangerous path for Barry to go down. So by the end of the episode, Iris’s engagement ring is gone. Wally is gone. Savitar is free. Everyone is crying and Barry has a huge hole in his torso. But on the bright side, Barry seems to have learned something: building your ideas of right and wrong on a foundation of overpowering emotions might end in tragedy. You paid a pretty hefty price for that little gem of wisdom, huh, Barry? At this point, I kind of think the writers are just making Savitar say a bunch of cryptic stuff so they can retroactively make literally any Savitar Origin plot make sense. I really like that Iris told Barry off for proposing out of a desire to save her, but her "I don't want to be someone that you're trying to save for the rest of eternity” line would’ve had more impact if the writers hadn’t relegated her to a damsel in distress for most of this season. "No, that's not her, that's Savitar!" My favorite trait of Julian’s is his completely pointless commentary on things. It might be a writing quirk, but I really hope it’s an intentional character choice from someone because it’s amazing how often he says things, with a straight face, that are clearly obvious to anyone with any sense of awareness or intelligence.